If you're looking for an RV campground in the state of Florida, you've just found one of the best around. 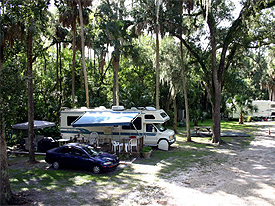 Tropical Resort & Marina offers some of the most desirable, convenient RV camping in Central Florida and beyond. When you camp your RV on our beautifully manicured grounds, you're placing yourself near all of the best Florida has to offer--from the sunny beaches to the major attractions in Orlando. In fact, one of the most exceptional Florida tourist draws is right in our backyard: The breathtaking St. Johns River. Not all Florida state campgrounds offer you the chance to enjoy incredible natural sites, a solar-heated pool and a gaming area all within a few yards of one another. But at Tropical Resort & Marina, there's no shortage of enjoyable things to do and see, whether it be cruising on the river, bass fishing, hiking, kayaking, manatee spotting, swimming, or just lounging in the shade and taking it easy. While you're here, make sure you take advantage of one of our affordable fishing boat, pontoon boat or kayak rentals when staying on our RV campgrounds--you'll be glad you did. Right off of our dock, you'll find the best bass fishing Florida has to offer, not to mention some unbelievable nature sitings. When you're done exploring the wonders of the St. Johns, head back to your RV on our pristine campground for some relaxation with a refreshment in hand, and a spectacular view of a warm, amber Florida sunset waiting for you. Once you're finally ready to venture off of our premises, there's plenty more to see and do within minutes of the resort. Enjoy the many Florida state and national parks nearby, or head to Daytona or New Smyrna beach for a day in the surf and sand. Since our resort is centrally located, RV camping on our property will afford you the opportunity to go to any of the most popular Florida destinations: Head over to Orlando and check out the theme parks--or swing by the space coast and witness history. If you're looking for just a short trip, step off the RV campgrounds at our resort and enjoy the quaint town of DeLand, which is right down the street from us. You'll find yourself delighted by the gourmet restaurants and the variety of night life options. By day, check out DeLand's high-quality museums (which vary in subject from fine art, to military and aviation, to geology and minerals, and more). There's so much to enjoy in our neck of the woods, and our affordable RV campground rates are just the cherry on top of a great Florida camping opportunity.